It is part of a 10-year National Pollinator Strategy. But some conservation groups say the plan does not go far enough. It includes countryside stewardship schemes, worth a total of £900m, to provide financial incentives for farmers to plant pollinator-friendly crops and let meadows grow. The plan is to be announced on Tuesday by Environment Secretary Elizabeth Truss. It will be the key policy announcement of her first major speech as environment secretary. The coalition has been criticised for some of its actions on the natural environment, including the controversial badger cull and a plan to sell off forests, which was ultimately scrapped. So Ms Truss will look to move the debate forward. She will say in her keynote speech that "our health, our jobs and our future prosperity and security depend on nature in this country". Ms Truss told BBC News that the new strategy was "all about helping our pollinators survive and thrive". Farmland, which covers most of England's land area, is the main focus. "Pollinators are really important for food and farming - for our rural economy, which is worth £210bn per year," she told BBC News. "The most important part of the strategy is the stewardship scheme, which has a specific pollinator element incentivising farmers to plant wild flowers, have pollinator friendly crops, and to carry out their activities in a pollinator-friendly way." The charity Buglife and Friends of the Earth both broadly welcomed the plan, but said that it did not go far enough on the regulation of pesticides. 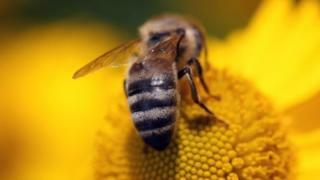 Referring to a 2013 decision by the European Commission to restrict the use of a group of neonicotinoid pesticides that were found to be harmful to honeybees, Buglife chief executive Matt Shardlow said it was time for the government to bring in new regulations to govern the testing of new chemicals. "We're not against pesticides entirely," he told BBC News. "But we're keen that there's better testing, so the ones that are ultimately used aren't damaging to bees." Media captionBuglife's Matt Shardlow shows the BBC's Victoria Gill around a rooftop in the heart of Manchester that has been designed specifically to attract urban bees. To make space across an increasingly urban landscape for insects, the government has secured commitments from landowners including Network Rail and the Highways Agency, which has agreed to undertake work to "enhance the grassland" on its verges. Mr Shardlow pointed out that these pollinator-friendly urban spaces were vital and he encouraged the public to help. "It is time now for everyone to come together around this national strategy; for government to deliver tens of thousands of hectares of restored wildflower habitats in the countryside, creating a network of B-Lines so that pollinators can move across the landscape effectively. "And for local authorities to transform roadside verges and public spaces into buzzing, colourful wildlife havens; and for the public to find space in their lawns to let the flowers bloom."